Gladiators were divided into different classes according to their weapons and fighting styles. There were strict rules and protocol surrounding the fights of gladiators. A gladiatorial fight would usually involve two gladiators but similar types of gladiators such as the Eques, would not normally fight each other. Gladiators were always clothed and armed to resemble barbarians with unusual and exotic weapons and their fights depicted famous victories over barbarians and the power of the Roman Empire. The Eques gladiator is also referred to in the plural as Equites, but this does get confused with one of the two upper social classes of Rome who are also called Equites. What type of gladiator was a Eques? What weapons and armor did they use? What was their style of combat? And what type of gladiator was matched as their opponent? There were therefore many different types of gladiator, including the Eques, who specialised in using specific weapons, armor and shields and applying different combat styles and tactics. The role of the eques was that of a horsemen. The equites were the first to compete in the day's schedule of gladiatorial games. These Gladiators were lightly armored as their role required agility. The equites entered the arena on horseback. Their opponents were other equites and their first round of combat would involve throwing a (lancea) or a verutum which was a short, light throwing spear. The eques would then quickly dismount and continue to fight on foot with their short sword (gladius), a 27 inch short straight sword. 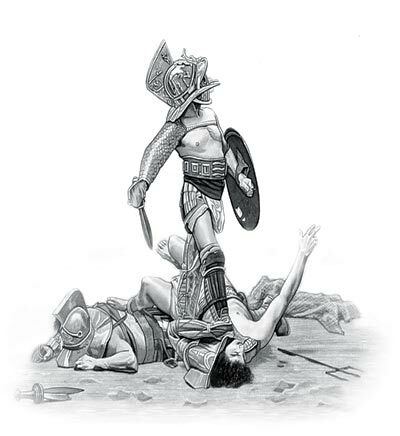 The content of this Eques category on the different types of gladiator who fought to the death in the gladiatorial combats staged in Ancient Rome provides free educational details, facts and information for reference and research for schools, colleges and homework. Refer to the Colosseum Sitemap for a comprehensive search on interesting different categories containing the history, facts and information about Ancient Rome. Interesting facts and information on this type of gladiator: their weapons, their armor and their style of combat.